Situated on the A34 ring road, near the town centre and next door to the ‘Express and star’, free parking is available at the clinic. We have both a male and female chiropractor, both with many years of experience. We see a vast range of people with a variety of problems from young children, older less able people, through to minor sports injuries and professional athletes. We specialise in the diagnosis, drug-free treatment and the management of musculoskeletal conditions. We believe that it is far better to treat the root causes of your problem rather than mask the symptoms with painkillers. Cannock Chiropractic Clinic provide a professional, honest and effective treatment for your back, neck or joint pain, provided in a friendly atmosphere and an easily accessible location. We are 100% committed to getting you better, offering treatments tailored to the person, our approach is to use as many treatment options that our many years of training, both within the degree course we studied and from the constant updating of our skills: we pride ourselves on having many different tools to use, such as active release for specific types of soft tissue work for muscle-joint and ligaments, shoulder specific techniques including the Neil Asher technique, acupuncture, joint manipulation or joint mobilisation and being from a sports background rehabilitation exercises are always important to us to help you achieve better health. 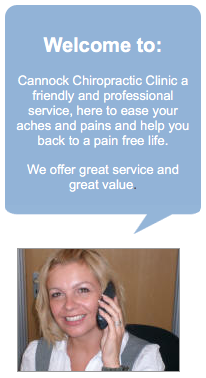 Our team are dedicated to providing a friendly, professional and ethical service to all our patients. We know that being in pain and having restricted movement can be a real problem. We will provide the best possible service and treatment we can to you and your family to help you get back to your best. People call us to discuss a range of problems from sciatica to headaches and over the years thousands of people have been pleased that they called us, so if you need to make an appointment please call our receptionists who will be happy to help. 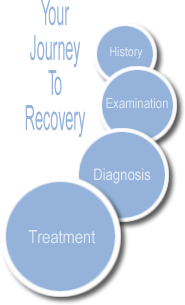 If your pain is affecting your work, hobbies or sports, give us a call now to get ‘back’ on track!